What are friends and why do we need them? How do we talk to our friends and how do we listen to what they have to say? What is peer pressure and how do we deal with it? Many children identify friendships as being a vital part of achieving emotional well-being, but some children experience difficulties both initiating and maintaining friendships. 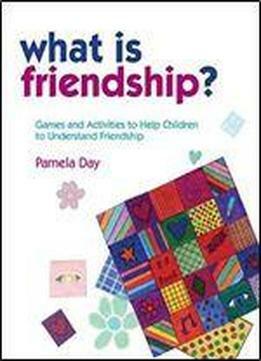 This fun and accessible programme contains detailed instructions and photocopiable handouts for teaching children about friendship. The book combines group activities, individual work, homework exercises and games, and will be especially useful for groups containing children with developmental and social difficulties, such as ADHD or autism. Developed in an inclusive classroom, this programme will arm children with useful strategies to deal with difficult situations such as negative peer pressure and conflict. What is Friendship? is ideally suited for use with children aged 7-11, but can be adapted for younger children or older children with developmental difficulties. It includes all the resources required to facilitate the programme and can be delivered by any professional involved in the education or care of children.